Male great grig Cyphoderris monstrosa, photographed by James Miskelly. The Haglida is a clade within the Orthoptera ancestrally characterised by the presence in males of a 'fan' in the forewings, an expansion between the branches of the posterior cubital vein (Béthoux & Nel 2002). Synapomorphies (from Béthoux & Nel 2002): Forewings with RP posteriorly ramified, with its branches distally ramified or RP simple; handle (pseudo-vein between origin of anastomosis CuA+CuPaα and CuPaβ) present; fan present (reversed in some derived taxa); branches of CuA + CuPaα strongly approximate (reversed in some derived taxa). [BNL02] Béthoux, O., A. Nel, J. Lapeyrie, G. Gand & J. Galtier. 2002. Raphogla rubra gen. n., sp. 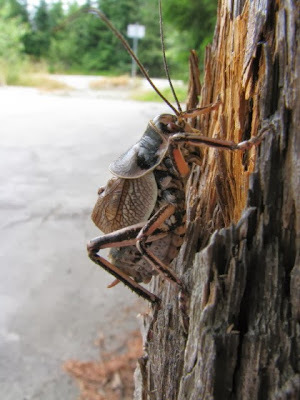 n., the oldest representative of the clade of modern Ensifera (Orthoptera: Tettigoniidea, Gryllidea). European Journal of Entomology 99: 111-116. [GR02] Gorochov, A. V., & A. P. Rasnitsyn. 2002. Superorder Gryllidea Laicharting, 1781 (=Orthopteroidea Handlirsch, 1903). In History of Insects (A. P. Rasnitsyn & D. L. J. Quicke, eds) pp. 293-303. Kluwer Academic Publishers: Dordrecht.